This map follows the example set by UNESCO. The UNESCO world map is comprised of 195 Member States and 8 Associate Members. This map is organized into five regional groups: Africa, Arab States, Asia and the Pacific, Europe and North America and Latin America and the Caribbean. As you look at the map, you will see that the definitions of the regions are specific to UNESCO and do not always follow geographical conventions. 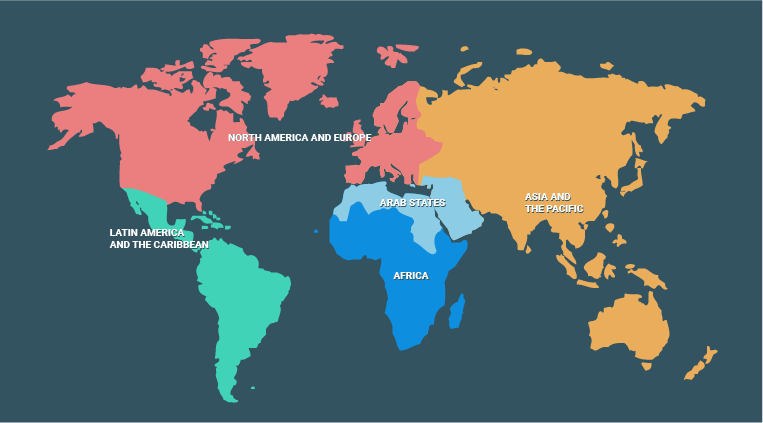 In order to promote equitable access to World Assemblies, the World Assembly Organizing Committee tries to visit each region once every five years. The colored nations indicate when and where ICET World Assemblies have been held and the table below details where we have been. The ICET World Assemblies provide an international forum for the exchange of information and the discussion of issues and trends in education and development. Since 1953, scholars, administrator, practitioners members of government ministries and business leaders have met annually to share their ideas, research and experience with professionals from around the world. The International Yearbook on Teacher Education represents the published record of the World Assembly usually but not necessarily including abstracts presented by the participants. Prior to 2012, the International Yearbook on Teacher Education was shared via a CD. Since 2012, a PDF of the Yearbook was published on the ICET Website. 17 1970 Sydney Teacher Education: The Challenge of the Seventies. International Perspectives on Theory and Practice. 18 1971 Kingston Crisis and Change in Teacher Education. International Perspectives on Theory and Practice. 19 1972 London Innovation Now! International Perspectives On Innovation In Teacher Education.